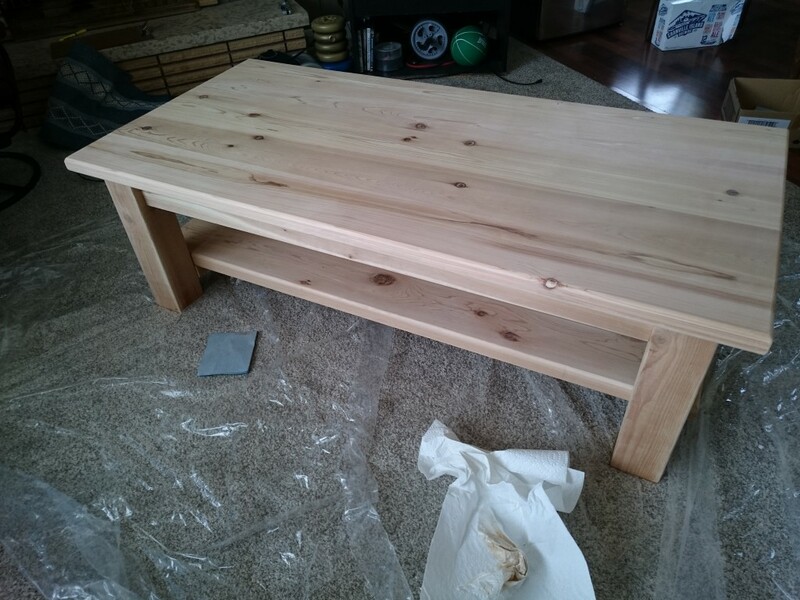 This post continues my documentation of my EC&I 831 Learning Project, where I am making my own coffee table. 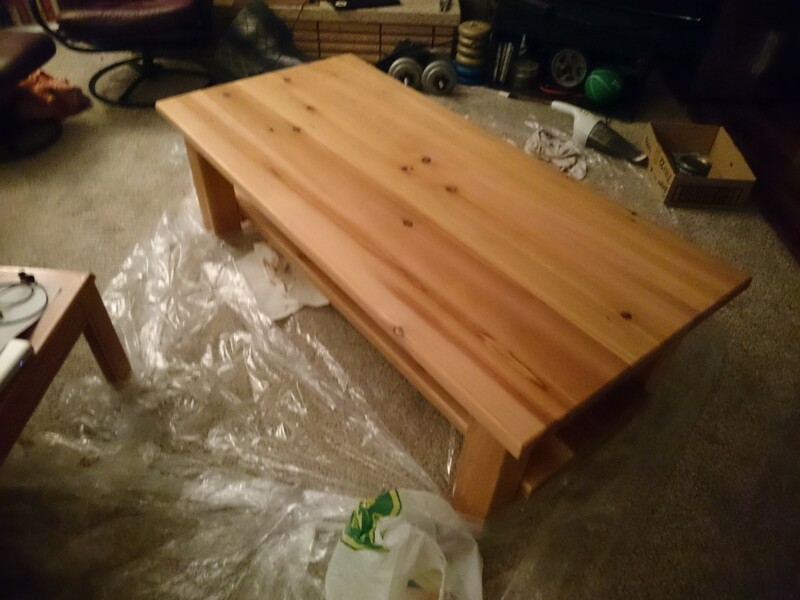 The last step of my coffee table was to put a coat of polyurethane on it. 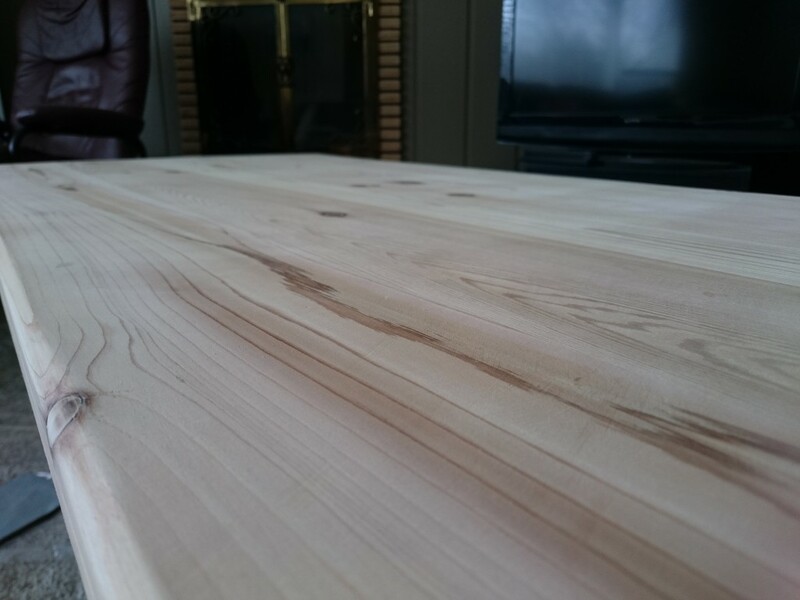 The wood I chose, cedar, is really soft and marks up quite easily – just running a fingernail over it left a mark. The polyurethane coat will protect it from this and add some durability to the surface, which will be used daily one way or another. 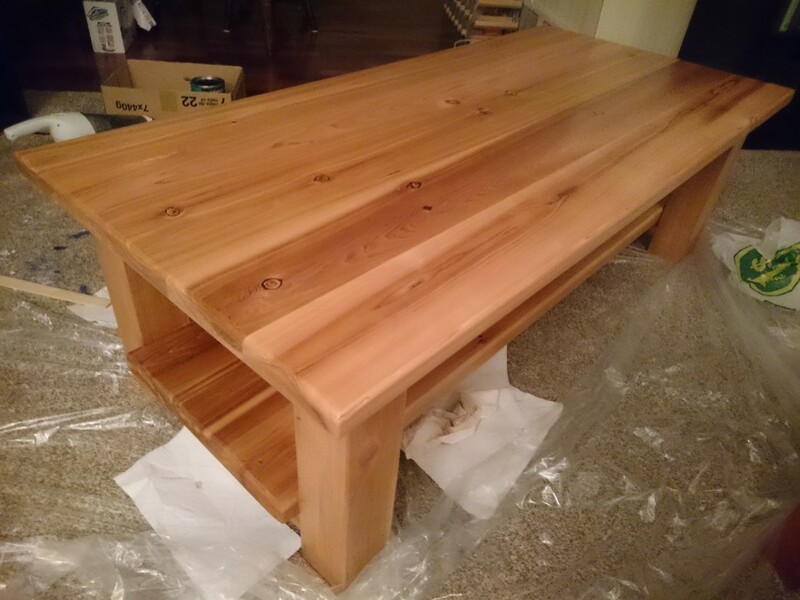 I went to Home Depot and got some polyurethane. I really had no idea what I was doing here, and couldn’t find anyone to help. So, I took a shot in the dark and purchased a can that looked good along with some foam brushes. Before starting to apply it to my table, I headed over to YouTube and found this great, cheesy resource. 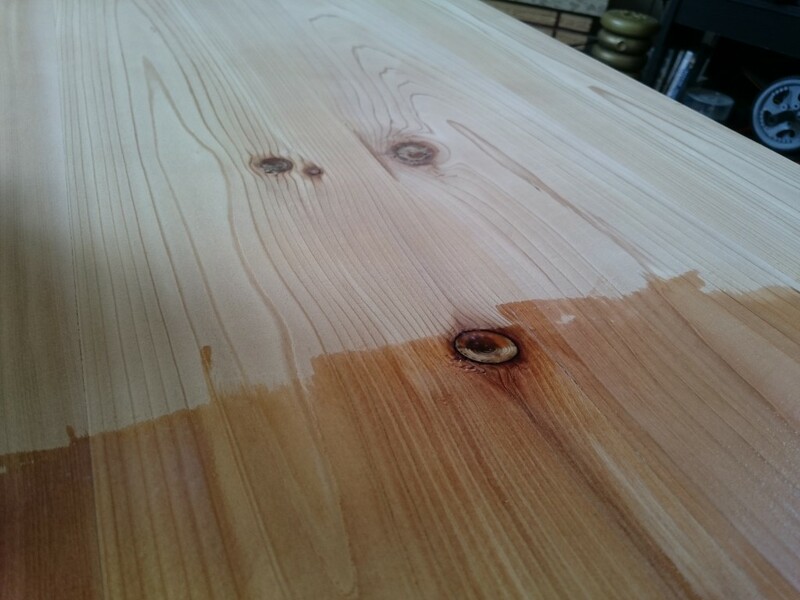 I was not planning on staining the table, since the natural colour is just great. So, I read the instructions listed on can and went for it. Here is my progress of applying the protective coating. Close up of surface before poly. 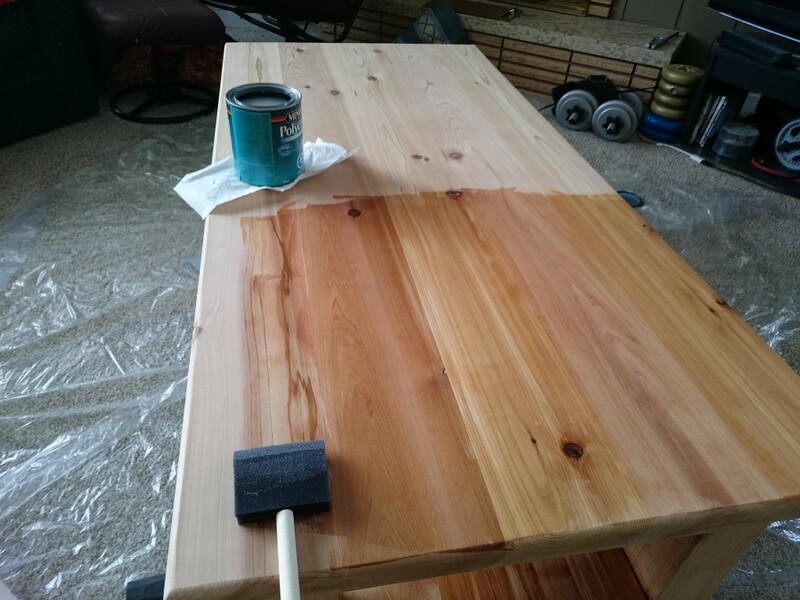 Starting the first coat. The darkness turned out to be more a wetness of the poly than colour changing.  Notice the difference between the poly’d and non-poly’d surface. 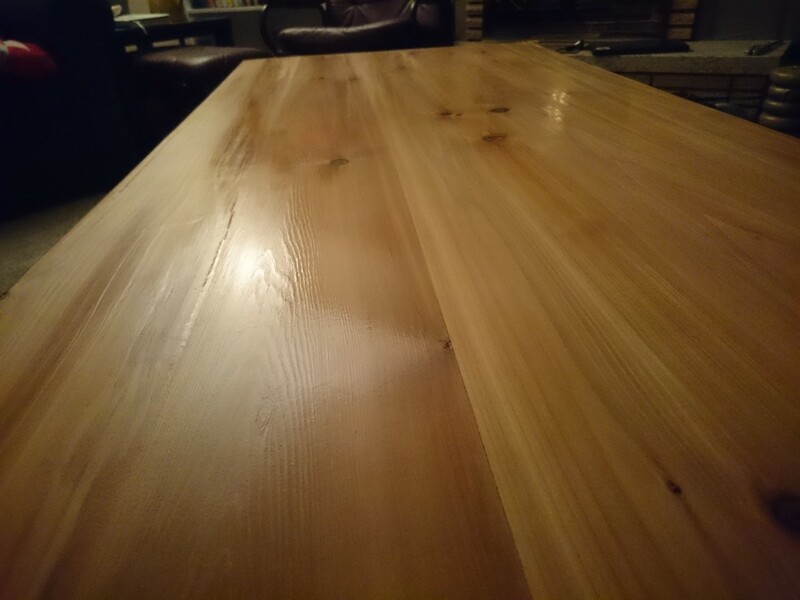 Adding the poly to the table top. It was really easy to see exactly what I had already poly’d and what I hadn’t, on the first layer at least. Following the first layer application. Different angle of after 3rd layer. Another after 3rd layer shot. 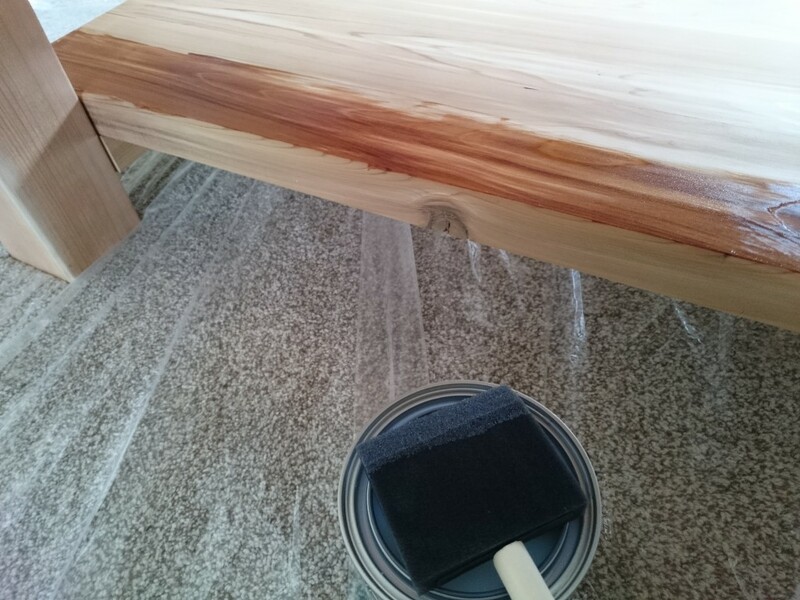 After the 3rd coat, notice the little bit of shine. This process took quite a bit of time. Luckily, the poly I chose had only a 2 hour wait period between coats, others have longer periods. Between each layer, I had to take a fine (220) sand paper and try to even out the previous application of the poly. I was able to complete this over the course of 8 hours. 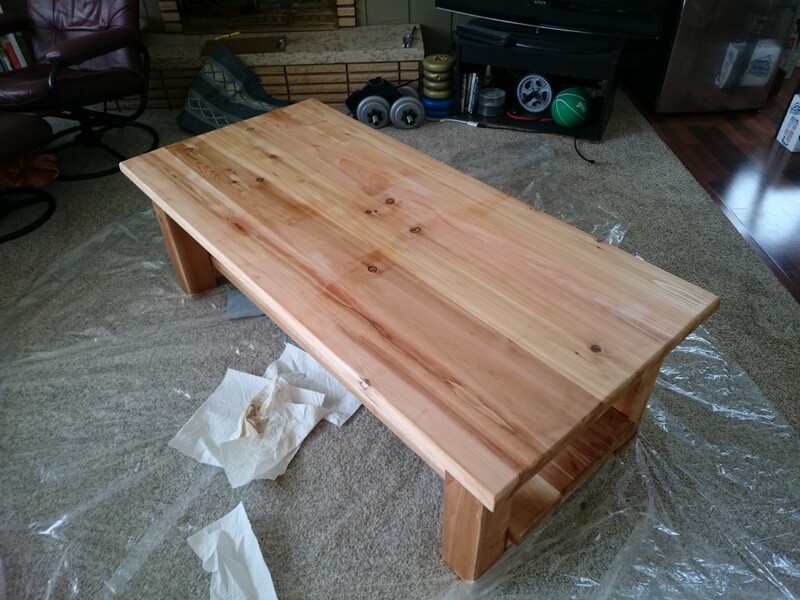 I let the last coat dry overnight and woke up to a final product that I’m quite proud of. 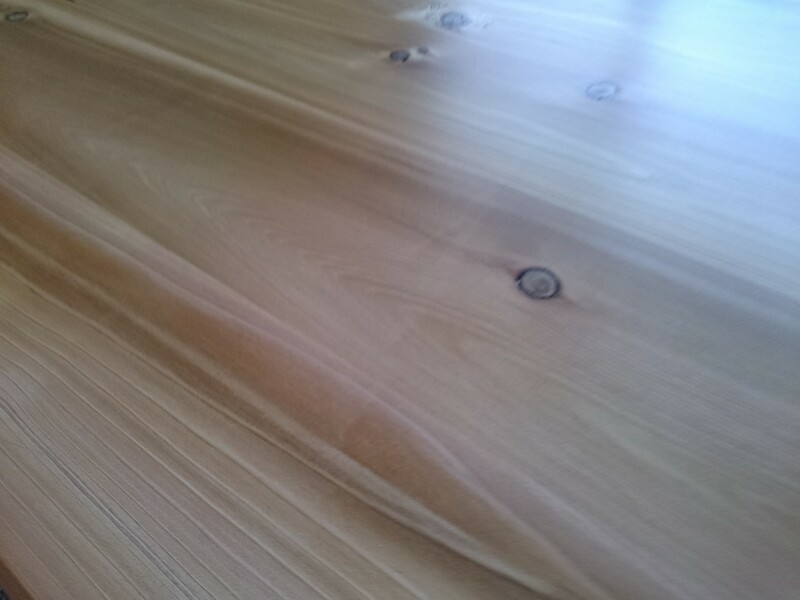 Close up shot of the polyurethane finish on the table top. 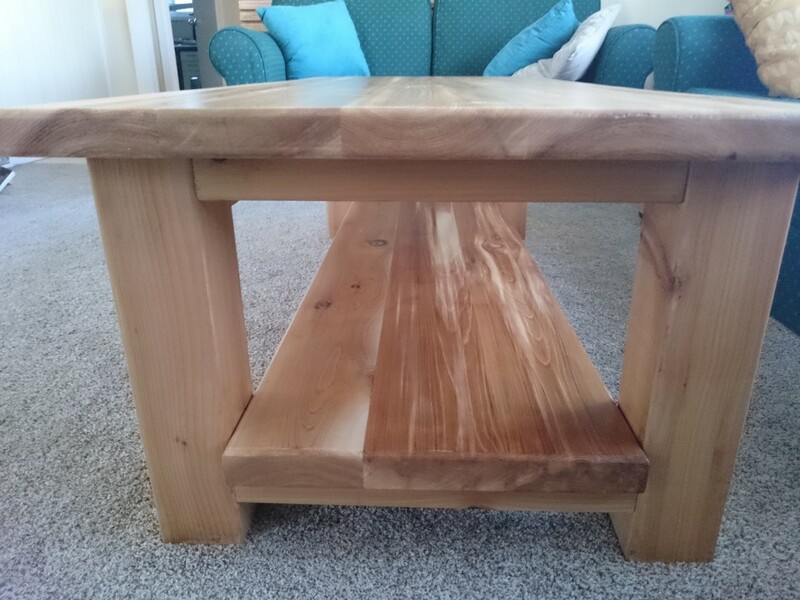 Different angle of finished table. A photo of the bottom shelf. Notice it ended up being quite a bit darker – which is why I picked those boards for the bottom. 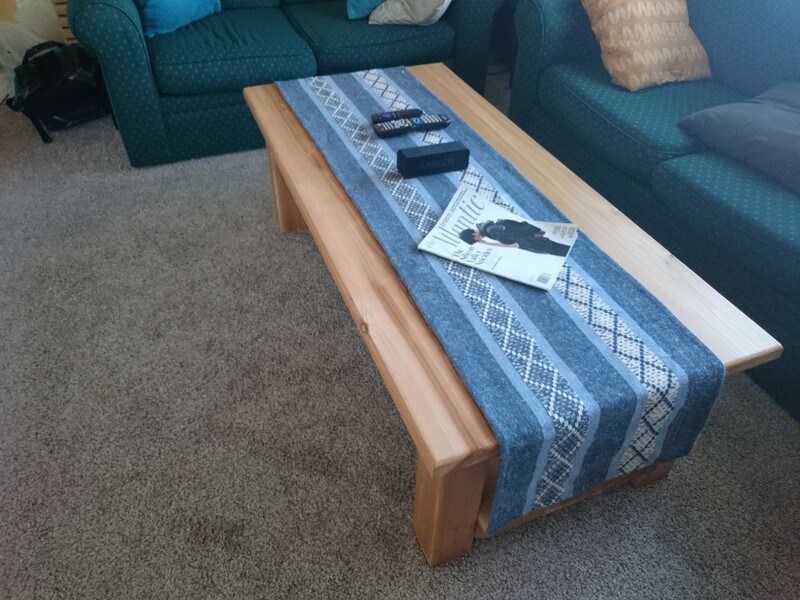 Threw a table runner on it, looks pretty good. 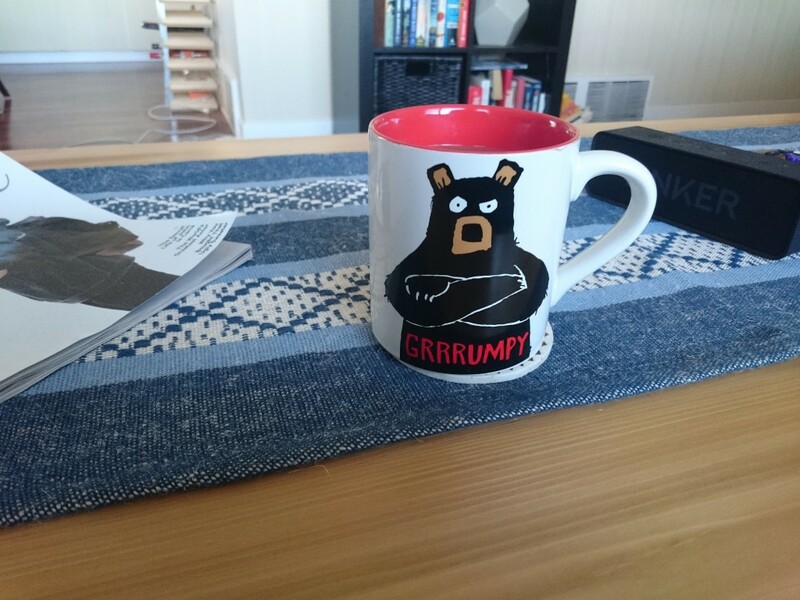 First cup of coffee on the coffee table. The mug does not at all describe my current mood! And that’s it. 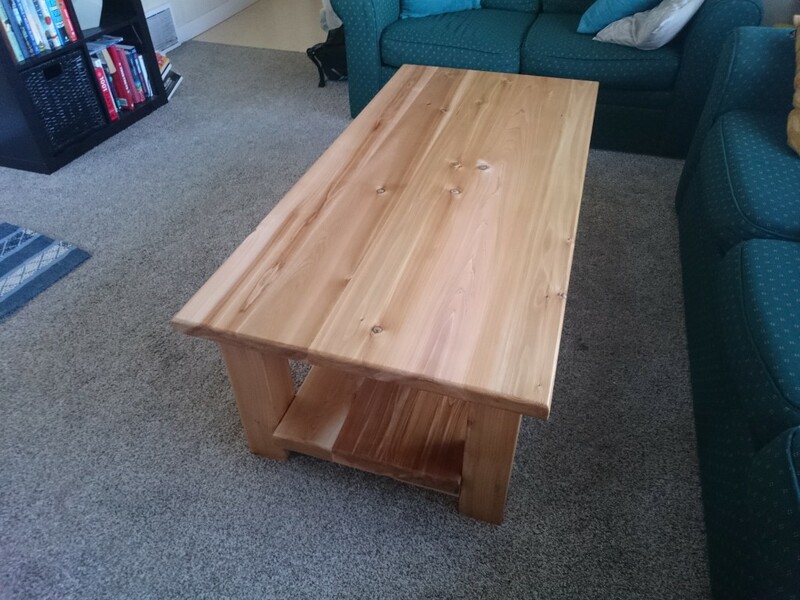 I made a table. 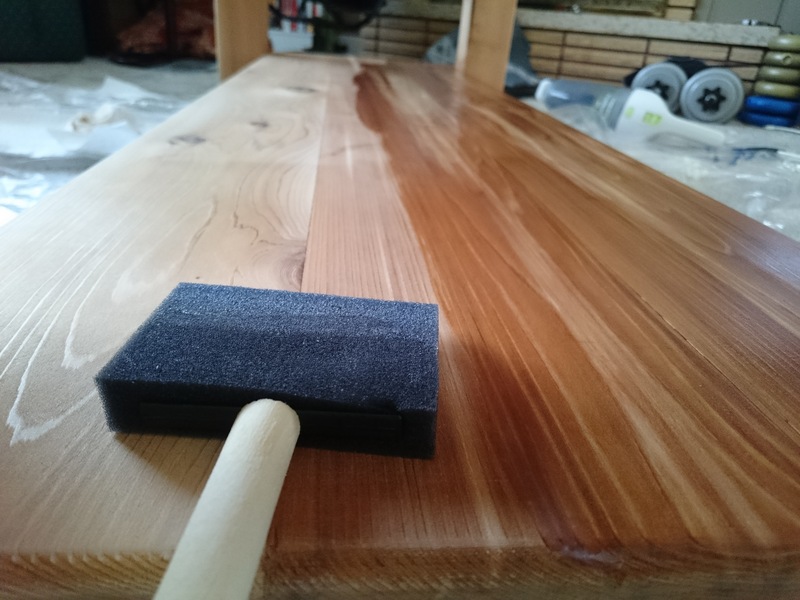 Applying the polyurethane was pretty straightforward, although it’s difficult to say if I put enough on (4 coats). 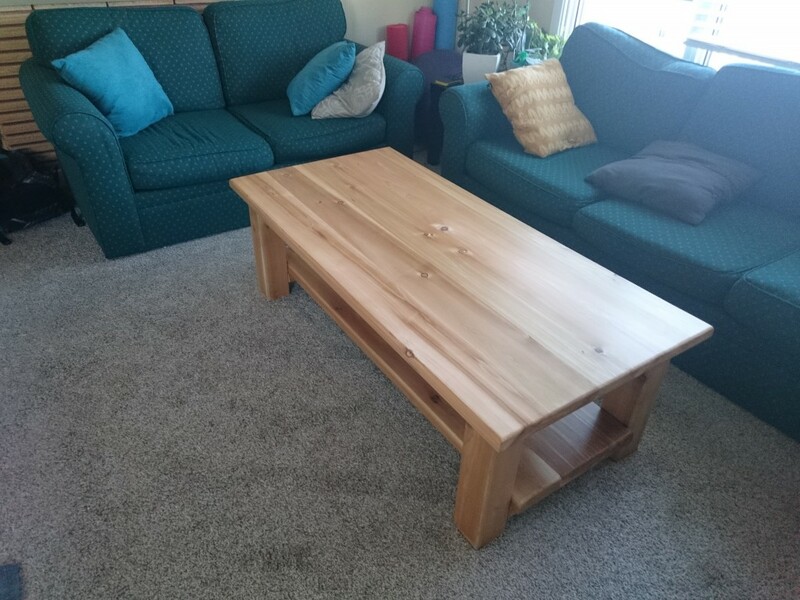 It is my hope that this table will last quite a long time and I can continue to grow and learn about woodworking and make my own furniture as I want. I will be posting a reflection on the process of trying to learn how to do this online following this post. Congratulations, and well done! Poly will help when you inevitably put a sweating glass onto the table directly. Still, I recommend your next project be a set of coasters! Keep up the good work. You should be happy with what you made. Thanks, Algot! I am already planning a set of coasters similar to those found at http://www.instructables.com/id/Wood-coasters/. I’m looking forward to learning more about woodworking and shifting towards making rather than buying when I can. Thanks, Janelle! It turned out much better than I expected when I first started.